Odaiba (お台場, 35.63° N 139.775° E) (sometimes known as Daiba and sometimes refered to as the Tokyo Teleport Town) is a large artificial island in Tokyo Bay, Japan. Administratively it is part of Minato, Koto and Shinagawa Wards. In 1928, the Dai-San Daiba (第三台場) or "No. 3 Battery" was refurbished and opened to the public as the Metropolitan Daiba Park, which remains open to this day. The modern redevelopment of Odaiba started after the success of Expo '85 in Tsukuba. The Japanese economy was riding high, and Odaiba was to be a showcase as futuristic living, built at a cost of over $10 billion. T3, as it was nicknamed, was supposed to be a self-sufficient city of over 100,000 residents. The "bubble economy" burst in 1991, and by 1995 Odaiba was a virtual wasteland, underpopulated and full of vacant lots. In 1996, the area was rezoned from pure business to allow also commercial and entertainment districts, and the area started coming back to life as Tokyo discovered the seaside it never had. Hotels and shopping malls opened up, several large companies including Fuji TV moved their headquarters to the island, and transportation links improved. One of two beaches in urban Tokyo (swimming not recommended), along with Kasai Rinkai Park in Edogawa Ward. Two Shuto Expressway lines access Odaiba: Route 11 enters from central Tokyo crossing the Rainbow Bridge, while the Wangan Route enters from Shinagawa Ward through the Tokyo Port Tunnel and from the bayfront areas of Tokyo and Chiba to the east. By public transport Odaiba is accessible via the automated Yurikamome transit system from Shinbashi as well as with the privately operated Rinkai Line running between Osaki and Shin-Kiba. City buses provide cheaper if slower access. 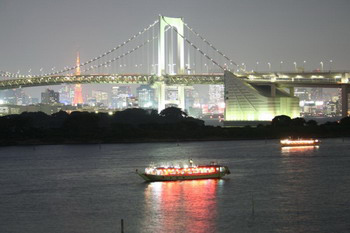 Ferries also operate between Tokyo and Odaiba.